A really Cool, really colorful caterpillar. 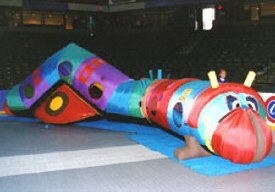 Over 40 feet of inflatable fun and entertainment that's a huge hit with the kids. There's lots of travel through adventure including a large slide at the very end. See-through port holes let's the kids see you as you keep an eye on them.